Why is Winston Being Handcuffed to Kingston? Published on November 29, 2013 in Caribbean, CARICOM, Complaints, General T&T, Jamaica, Law and Politics. 28 Comments Tags: CARICOM, Politics, Stephen Kangal, T&T Govt. The problem relating to the legitimate refusal of 13 Jamaicans entry into T&T by our Immigration officials took place at Piarco. The documentation/personnel/ and Minister Griffith responsible for the interviewing process are here. Foreign Affairs is a ceremonial conduit in this matter. Why then is Minister Dookeran being summoned and voluntarily escorted/handcuffed to Kingston by the resident Jamaican High Commissioner with his tail between his legs and the blessings of his Prime Minister? They must appreciate the bigger underpinnings and enormity of this unregulated influx of Jamaicans into T&T. It presents wider and deeper challenges to T&T for national security concerns, crime reduction, the illicit drug scourge, education and social services? Our Parliament had no say on this matter. Published on November 26, 2013 in General T&T and Politics. 5 Comments Tags: Kamla Persad-Bissessar, Stephen Kangal. God can be neither at the side nor at the front of the Prime Minister if the tenets of Hinduism are applicable. She said that she puts God in front of her. Then she walks after Him. Consequently all that she does is what God does because in her own words, repeated ad nauseam, she walks after God. All her foot-steps are determined and fashioned by Him because that is the only way she can walk behind God. Published on November 24, 2013 in Books, Crime in T&T, General T&T, Law and Security. 1 Comment Tags: Abuse, Kamla Persad-Bissessar, Politics, Prison, Raffique Shah, T&T Govt. Avid readers of fiction, more so Jeffrey Archer fans, will immediately note that I stole this headline from one of the writer’s successful novels, A Prisoner of Birth. I did this deliberately, for several reasons. For the uninitiated, Lord Archer is a Conservative peer whose best-selling novels have topped 150 million copies. He also served a four-year jail sentence for perjury, so he knows about prisons and imprisonment inside out, in a manner of speaking. In fact, he spent some of his jail time in the high-security Belmarsh Prison located in London. Published on November 24, 2013 in Africa, Caribbean, CARICOM, General T&T, People's Partnership, Politics, Race and Identity and Racism Watch. Closed Tags: African, CARICOM, Kamla Persad-Bissessar, Politics, Ralph Gonzalves, Reparations, T&T Govt. A National Committee on Reparations is being established in Trinidad and Tobago, the Communications Unit of the Office of the Prime Minister said yesterday. In a media release, the Communications Unit said persons responsible for setting up the Committee met with Prime Minister Kamla Persad-Bissessar SC at the Parliament Building on Friday. 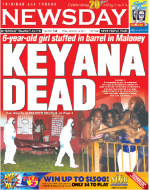 Published on November 21, 2013 in Crime in T&T, General T&T, Kidnapping, Police and Violence. 4 Comments Tags: Abuse, Crime in T&T. 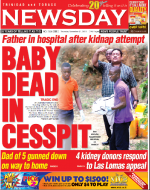 THE search for a two-year-old baby boy ended in tragedy yesterday afternoon after his body was found inside a cesspit located at the back of the child’s father’s Maracas/St Joseph home. At about 1.15 pm yesterday police officers from the St Joseph CID and the Maracas Police Station, led by Sergeant Rene Katwaroo, made their way to the home of Allan Thomas, located along Santa Rita Trace, Lluengo Village, Maracas/St Joseph. The officers were responding to a report made by Thomas on Tuesday night, in which he alleged that his son, Jacob Munroe, two, had been kidnapped. Published on November 19, 2013 in COP, General T&T, ILP, Opposition Party, People's Partnership, PNM, Politics and UNC. 2 Comments Tags: Kamla Persad-Bissessar, Politics, Stephen Kangal, T&T Govt. It is now patently clear that the mathematically-challenged eleventh hour imposition of the hapless PR formula based on the infamous 25% threshold without undertaking the requisite public consultations by the PPG has crystallized into a pure, unmitigated electoral disaster that back-fired big time. It consigned thousands of burgesses/ electoral districts to be without representation in their respective local government councils. Published on November 17, 2013 in General T&T, Opposition Party, People's Partnership, PNM, Politics and UNC. 3 Comments Tags: Kamla Persad-Bissessar, Keith Rowley, Politics, Raffique Shah, T&T Govt. Much to the dismay of its detractors, the People’s National Movement (PNM) bounces back like the proverbial bad penny almost ritually every five years since it first lost an election in 1986. In the current political scenario, unless the 57-year-old party shoots itself in the head, the incumbents discover some magical elixir, or a mass uprising, a kind of “Trinidad spring”, occurs and spawns something new and exciting, the PNM will return to power in 2015. Published on November 11, 2013 in General T&T, ILP, India, MSJ, Opposition Party, People's Partnership, PNM, Politics, Race and Identity, Racism Watch, TOP and UNC. 3 Comments Tags: Jack Warner, Kamla Persad-Bissessar, Politics, Stephen Kangal, T&T Govt. Being a classic marginal seat, Monday’s St. Joseph Constituency (SJC) bye-election results have encapsulated and mirrored the psycho-political underpinnings of the changing electoral dynamics as well as of the traditional ethnic moorings impacting on and progressively shaping the national political/electoral psyche- a microcosm of the macrocosm.